WSU won it's opening NCAA matchup, 5-1, against Montana. It was the Cougs' 13th win of the year, one shy of the program record. Round 2 against the Georgetown Hoyas begins 10:30 a.m. PST Friday, Nov. 16, and will be streamed live. 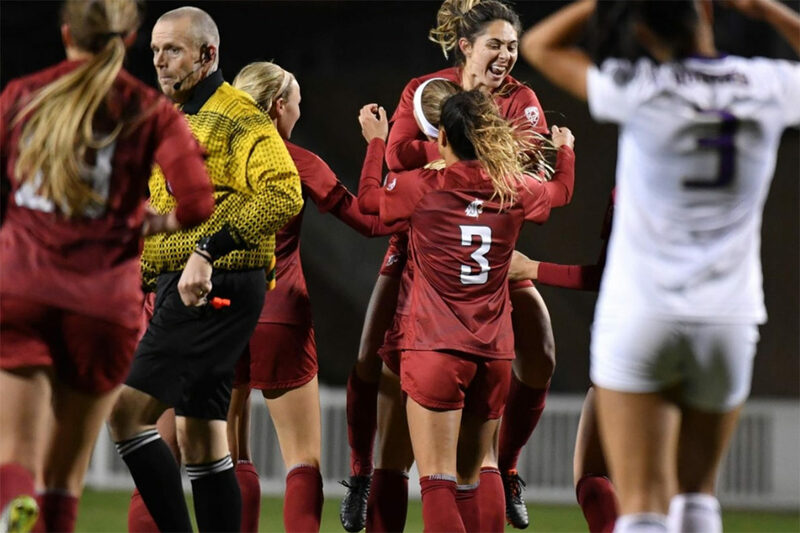 The Washington State women’s soccer team travels to the nation’s capital to face the No. 2 Georgetown Hoyas for the second round of the NCAA National Tournament today, Nov. 16. The Cougars sit one win away from tying the program’s best record in history after beating Montana 5‑1 in the opening round of the tournament last week to move to 13‑5‑1. The top‑seeded 18‑0‑3 Hoyas beat Butler 1‑0 last week to advance to the second round. This will be the first time ever Washington State and Georgetown will face off in women’s soccer. The match is set for 10:30 a.m. Pacific Time. It originally was to be played at Georgetown but poor field conditions prompted it to be moved to the George Washington Mt. Vernon complex at George Washington University. Georgetown is expected to livestream the match for free.